Backyard playsets like our Smokey Bear Hideout Cubby House are just like all cool tree houses, but you don't need a tree to build it. Hi, I'm Smokey the Bear, Jr. and this is my hideout! It is full of fun things for me and my friends to do. We play in it all day long, and then can't wait to do it again the next day. We like to climb u the rocks on the climbing wall, run into the cubby and hide. If the bad guys are waiting for us in the cubby house, we make a quick escape down the slide! Your kids are going to love playing in my Smokey Bear Hideout cubby house so much that you will have a hard time getting them to come back inside. Smokey is right! Your kids will love playing in the Smokey Bear Hideout Cubby House, and you will love the way your children get so much from this cubby as its size, 2400 x 3000, is perfect for a large or growing family. For other size options if your backyard is small, see the Kookaburra Loft cubby house. The central cubby has a leak-proof roof, a center doorway and four large windows for much needed airflow on hot days. This is an elevated cubby that comes with decorative lattice to surround the base of the structure, or you can choose to add a sand pit for added fun for your kids. 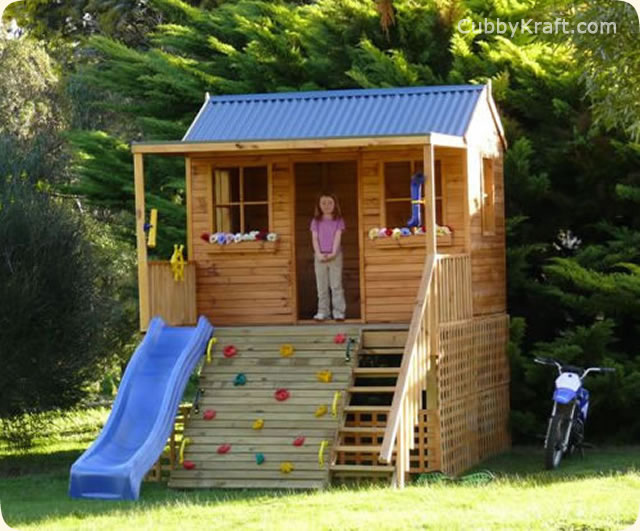 There are toys and accessories that come with this cubby house. They include: a steering wheel, periscope, rocks for the climbing wall, telescope and safety handles. Pretend you're a biologist for a day and experience your backyard with your kids using your senses. Get a magnifying glass or even binoculars for close-up views of anything you might find and go on an adventure in your backyard. Let your kids explore with their eyes, ears, noses and fingers. Peer under logs and rocks insects, but be careful, and make sure there's always an adult around. Sniff the trees and the flowers. Feel the rough bark or the skin of a lemon, use a crayon and paper to do texture art. Then silently listen to what's going on around you, like the sounds of the birds, water, wind or even the trees rustling. Once you've been on your journey of discovery, head back to your cubby house and let your kids draw or write down what they've seen and you can talk about it together. Allow them to decorate their cubby house or fort with their texture art work and other pieces. Backyard toy accessories are available for the Smokey Bear Hideout, they include a full or half front door with a handle that can be attached, flower boxes to pretty up the front part of the house, skylights for more natural light in the cubby house, and a letter box. These will all help your children feel right at home in their cubby house. This cubby design really benefits from the skylight accessory to allow more light into the cubby house. 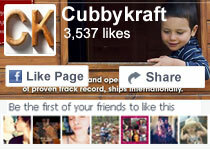 Safety, as well as fun, is of the utmost importance for each design at CubbyKraft. You will find that the Smokey Bear Hideout cubby house is made of non-toxic material and only the finest in Australian organic timber. It's sanded down into a sleek feel that makes it entirely safe for kids to play in and around. The windows are glassless and the toys are sturdy. 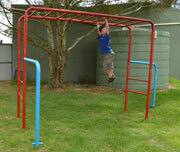 The elevated design is sturdy as it is secured with structure support posts. Parents can be at ease knowing that their children are playing safely in their cubby house in their backyards. 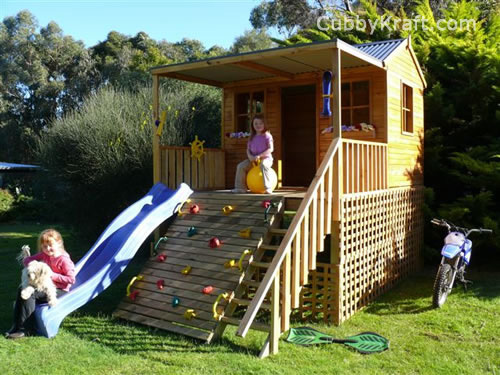 The Smokey Bear Hideout cubby house kit can be shipped anywhere in Australia. The precut pieces are very easy to assemble and all of the easy-to-read directions come in your cubby house kit. The cubbies are designed for the average handyman to put together, but you are not alone! Do-it-yourself consultants are always available to give you a hand through online videos, see the link on the right hand side of the age, through email and over the phone during normal business hours. Instructions are clear and easy to follow, clearly labeled you will be able to put this together and if tour children are old enough, you may want them to help. It will make them feel like they had a special job building their own cubby house. 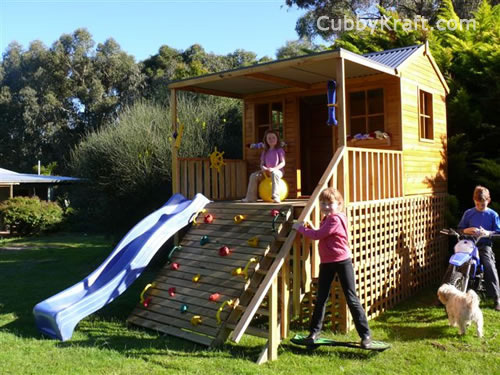 Cubbykraft Cubby Houses are designed and built in Australia for Aussie kids!